"Five little monkeys jumping on the bed. One fell off and bumped his head. Momma called the doctor, and the doctor said.... Ma'am your monkey's dead!" 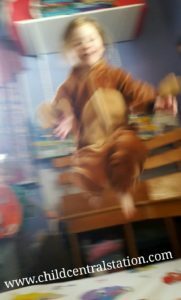 The children were singing five little monkeys a few weeks back and one of them decided to create their own version. The new lyrics were finished with some giggles, and sparked a matter of fact conversation. Many of the children in our program have experienced a death in their family (grandparent or great grandparent) or a death of a pet in the last year. Death is one of those topics that can be hard to talk about, but like all things, children tend to work through those tough topics with play! During this particular conversation, the children stopped playing and had a serious talk. One child said... "Well, maybe the monkey broke his hip like my Nana." Another child chimed in with "maybe the monkey was just really, really sick." Children are very observant, they know more than we often give them credit for. Death is a part of life, and is a topic that can be difficult to talk about, but the more natural we approach the topic, the more children understand. Dan Hodgins and I talked about death in the third episode of The Shakin' Bones podcast. If you have not listened to it yet and would like to, Here it is! (Click on Episodes and choose episode #3 Death). Some of the ways that the children work through death here is by playing dead. The children are often pretending to die and other children often assist in their burials. 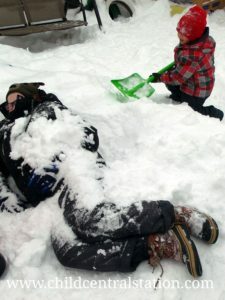 In the wintertime, they bury each other in the snow. In the summer, our large sandbox is often home to numerous funerals. Dan mentioned in the podcast, we often set up dramatic play areas for the children, and having a funeral parlor or cemetery may be just as important as setting up a grocery store. 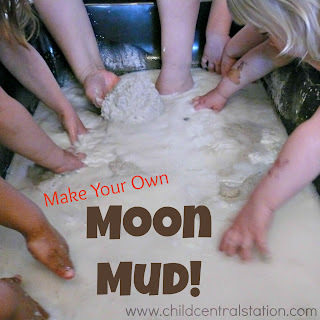 Children work through their feelings and practice rituals through play. 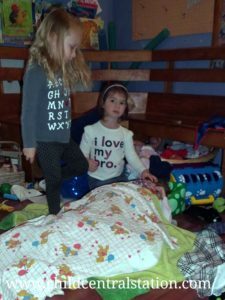 We don't have specific areas set up for dramatic play here at Child Central Station; the children define and create their own spaces while playing. Through their play, the children also take on care taking roles, as they pretend to be doctors and nurses. It is almost a daily occurrence for the children to pretend to be sick or dying. Please remember that when talking about death with young children that they are very egocentric and concrete learners. When they ask questions or are faced with the death of a loved one or pet, be direct. Use the term death, or died. When you say things like passed away or we have even heard in some cases "sleeping" it is confusing to the children. Also, talking about death in terms of what people can and cannot do. Someone who is dead cannot eat, they cannot sleep, they cannot poop... normal activities that are typical for children. Often times, children are most concerned about death in terms of "am I going to die?" One of the things Dan mentions in the podcast is teaching children to learn to feel/listen to their own heart beat. It gives them immediate reassurance that they are not going to die right now. Every child, every person deals with grief and loss differently and on their own timelines. Children may just need to know that you are there for them and need a lap to sit on. Feelings are often difficult to express, and not all children have the words to describe how they are feeling all of the time. Children who are experiencing a loss may have some behavior changes. Do the children in your program pretend to be dead or dying? Do you have any great resources for children and families? I would love to hear about them !